Yelena Snovsky is a nationally recognized award winning artist. Her work has been juried into events around the country, including the Oil Painters of America 21st National Juried Exhibition of Traditional Oils, American Impressionist Society, American Artists Profession League Grand National Exhibition as well as National Invitational Plein Air Events, such as "Easels at Fredericks", "Paint Annapolis" and others. 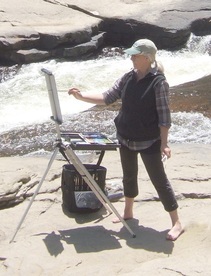 Her work received numerous awards and publications, including second prize from the Salmagundi Club in Manhattan, Caivano Memorial Award from the Guild of Creative Art, publication in the book “ 100 painters of Mid-Atlantic “, American Art Collector, “2012 Mountain Plein Air calendar” and others. Yelena worked as a technical illustrator after graduating university with degrees in engineering and graphic art. She also worked as an advertising illustrator for many years, creating images for various local businesses throughout the New Jersey area. Yelena enjoys painting in oil on canvas. Her art work includes landscapes, seascapes, portraits and still life. Yelena is especially interested in plein air painting and the idea of sharing her instant impression of the moment, in the moment. Most of her landscapes are painted entirely outdoors, in natural light. To learn more about the artist and her work, you can contact the Frederick Gallery in Spring Lake at (732)-974-0376, Salmagundi Club in NYC at (212) 255-7740, Guild of Creative Art in Shrewsbury, NJ at (732)741-1441. 2009 Ridgewood Art Institute, study with internationally recognized painter and teacher John Phillip Osborne and nationally recognized painter and teacher Danielle Wexler a classical methology and the "prismatic palette" that has its origins in the French Barbizon School. Valentin Serov, Childe Hassam, Mark Hanson, Jon Redmond and other artists had a strong influence on Yelena. "28th Best of America National Juried Art Show"
​"Does it much the Couch? A Juried Exploration of Color"
​SCNY "Landscapes : Day and Night"
2012 Oil Painters of America 21st Annual National Juried Exhibition of Traditional oil. Awarded "In the French Tradition Award 1"
Painting "Cheese and Wine" was published. © 2019, Yelena Snovsky-Fine Art. All Rights Reserved.